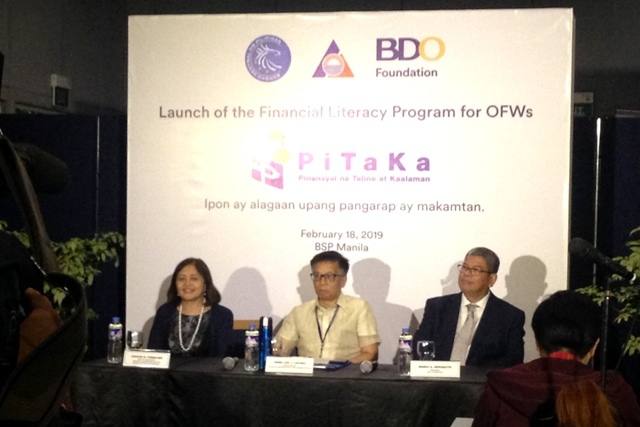 The Bangko Sentral ng Pilipinas (BSP), together with the Overseas Welfare Administration (OWWA) and BDO Foundation forged a partnership to improve the financial literacy of Overseas Filipino Workers (OFWs) and their families. Dubbed as PiTaKa or Pinansyal na Talino at Kaalaman, this program aims to equip OFWs with the ability to better manage their remittances, get out of debt, set aside savings or make prudent investments in preparation for a better life when they return home to the Philippines. The program also targets OFW families to sensitize them of the temporary nature of overseas employment and encourage them to support their loved ones by spending wisely, saving regularly and looking for ways to augment their family income. During the program launch held on February 18, 2019 at the BSP Assembly Hall, heads and senior management of the BSP, OWWA and BDO Foundation signed a Memorandum of Agreement, affirming their commitment to implement the program. Over 200 stakeholders from the OFW community, government and private sectors witnessed the signing ceremony, and the preview of the three entertaining videos with embedded financial literary lessons and messages. These videos will be used as tools in the financial literacy sessions to be incorporated in the Pre-Departure Orientation Seminars (PDOS) and Post-Arrival Orientation Seminars (PAOS) that all OFWs are required to attend. These will also be used during the General Orientation for OFW families. Session guides/training kits will be developed and a Training of Trainers will be conducted for OWWA trainers and OWWA-accredited PDOS/PAOS providers to ensure sustained and effective delivery of financial literacy lessons. In a message delivered by BSP Deputy Governor Chuchi G. Fonacier, BSP Governor Nestor A. Espenilla, Jr. said that “Layunin ng PiTaKa Program na ang bawat OFW ay magkaroon ng angkop na kaalaman sa mga pampinasyal na bagay, ng sa gayon sila ay tunay na makatulong sa kani-kanilang mga pamilya. “Ang paglaganap ng inklusibong pananalapi ay isang pamamaraan upang mabigyan ng kapangyarihan at kakayanan ang lahat ng kasapi ng ating komunidad, higit sa lahat ang ating mga OFW. In 2018, OFWs remitted more than US$26 billion and continue to be major drivers of domestic demand. This makes them ideal beneficiaries of a targeted financial education program. The financial learning tools and sessions developed under PiTaKa are designed to fit the OFW psyche, with the ultimate objective of eventually changing financial behaviours, transitioning them from being big spenders to becoming regular savers, investors, and even business owners. 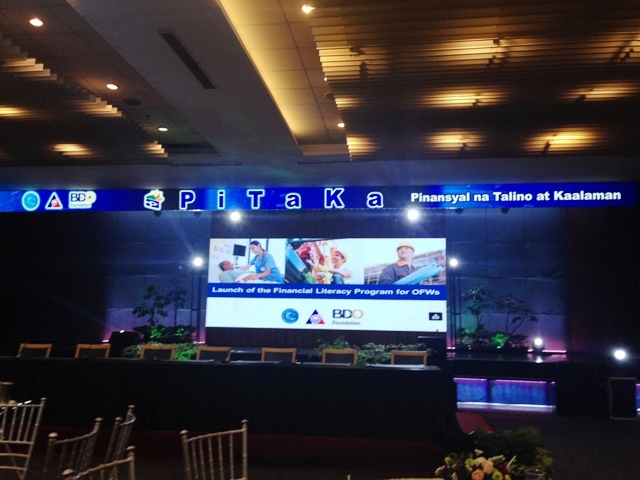 With PiTaKa, the BSP, OWWA and BDO Foundation hope to enable a future where OFWs can come home permanently to enjoy financial freedom and the fruits of their labor.